A blast of warm, summer breeze blew sand into the children’s eyes. "Mummy," Peter shouted, rubbing his eyes. "Och, come here bairn. Let me wipe your eyes for you," she said, grabbing a soft towel. She wiped the sand out of his blue-green irises. "There now, is that better?" "Aye, Mummy; much better," he smiled. "How’s the water today, Peter?" she asked. "It’s a bit cold, but I’m having fun," he replied. "I’m going back for a wee swim." He ran into the waves. His mum laughed as she watched him splashing about in the shallow water. She sat on her beach chair, fanning herself with her book. The sun was giving her some much needed color as its rays shone across the shimmering water and sand. The aroma of something wonderful and delicious came floating towards her. "What is that?" she said. She turned and looked behind her. "Och, it’s coming from the fish and chip stand. I wonder if Peter will be hungry?" She stood up, dropped her book on the blue and white striped chair and put her hand over her eyes, blocking the sun so she could search for the lad. "Peter!" He heard his mum calling and ran out of the water. "Mum!" He waved, catching her attention. "Peter, are you feeling a wee bit hungry? I can smell fish and chips and thought now would be a good time to have our lunch," she suggested. "That sounds brilliant, Mum. After lunch can I have a donkey ride?" he begged. He pointed at the man leading a small gray donkey around the beach. "Will said it was great fun when he did it." "I suppose you can. Let’s eat our fish and chips first though," she said and they headed for the chip shop, a way back off the sand. "We’d like to have four bits of haddock and some chips, and oh, two pickled onions," she ordered. Within a few minutes their food was ready. They sat at one of the picnic tables and devoured their fish and chips. Peter poured vinegar on his and tomato sauce too. "Now can I go on a donkey ride?" he pleaded. "Och, all right," his mum gave in. They walked toward the man holding the reins. "Peter would like a donkey ride," she said to him. "That’ll be 50p for a ride up and down the beach. It takes about quarter of an hour," he replied. "That’s fine. I’ll go and sit in the chair and watch you, Peter," Mum said and walked away. Peter asked the man, "What’s the donkey’s name?" "It’s Norton. He’s five years old now," he answered. They moved along through the sand. 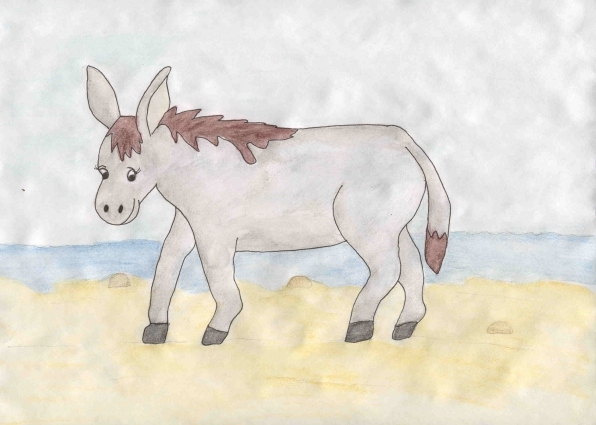 Peter bobbed up and down as the donkey clomped along the beach. Waves rolled across his hooves, but Norton didn’t seem to mind. "Norton’s a nice donkey," Peter said. He petted the top of his head and his ears. Norton let out a loud bray, frightening Peter. "It’s all right, lad. Norton doesn’t like his ears touched," the man warned. "He’s got a loud bray," Peter giggled. All the other children watched as Peter and Norton walked by. He heard them telling their mums that they wanted a donkey ride. Peter waved at them. Some of them waved back. Most just stared. "Nice Norton," he said, rubbing his coarse hair. He turned his head and looked at Norton’s tail. "His tail is long. Do you have to brush it?" he asked. "Yes, I do. I have to take good care of Norton and keep him clean and healthy." "Only wee ones can ride Norton, not our mums and dads," Peter noticed. "Och, you’re right there, lad. Norton’s not big enough for anyone but the wee folk, but he loves to walk up and down the beach. Sometimes, at night, after everyone’s gone home for the night, I let Norton run free. He’ll head all the way down to the cliffs over yonder and I can hear him braying. It’s like he’s saying, ‘Look at me!’" the man said. Peter thought about Norton running wild. "I’m glad he’s not running now. I’d fall off!" He started to giggle. "Does Norton like fish and chips?" "Och no, lad. Norton eats hay and grains. Sometimes I give him an apple or a pear. When your ride is done, would you like to feed him an apple?" the man asked. "I’d love to," he answered. They walked in silence all the way back. Peter watched the other children jumping about in the water. He saw a lass building a rather large sandcastle. She was using a bucket and spade. Suddenly a wave came rolling in and washed some of it away. She began to cry and ran to her dad. "Hi, Mum!" he waved as the donkey passed her chair. She waved back. When his donkey ride finished, Peter jumped off into the sand. "Here you go, lad," the man said, handing him a small red apple. "Hold it in your hand and dinny be afraid. He’ll not nip you." Peter laid the apple in the palm of his hand and moved it in front of Norton’s nose. The donkey seemed to smile at him as it lowered its mouth over the apple. It’s wet lips tickled Peter’s hand. He was a wee bit afraid, but held still. He could see Norton’s teeth. The donkey lifted its mouth and Peter pulled his hand away. He watched as Norton chewed it up. He reached up and petted him between the ears, being careful not to touch them. "Good donkey," he smiled. Just then another lad and his mum walked over. He wanted a ride on the donkey. "Well, Peter, it’s time to go," the man said. "Thank you for the ride and for letting me feed Norton," Peter said. He ran back to his mum. "Mum! Mum! I fed Norton!" "Norton? Who’s Norton?" she wondered. "The donkey. I fed the donkey an apple. It ate it right out of my hand and it tickled," he chuckled. "Very good. That was nice. Did you enjoy your ride?" she asked. "It was great fun, Mum. I want to do it again the next time we come," he answered. "We’ll see, Peter. Go and play then. We have to leave in half an hour," she warned. Peter ran down to the water and washed his hands in the salty waves. "Cheerio, Norton," he shouted as the donkey walked past. Peter and his mum gathered up their belongings and carried them back to the car. That night Peter told his dad all about his day at the beach. "It was fun, Dad!" Sweet dreams filled his head that night - dreams of donkeys, fish and chips and sandcastles.